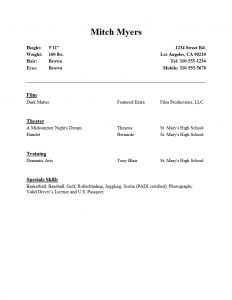 The Beginner Acting Resume Template gives beginners a structure for their initial resume. It’s no secret that casting directors have a burdensome schedule and will not waste much time on an improperly done resume. The required sections for an actor’s resume are all included in the Beginner Actor Resume. It’s important to note that while all sections are physically available on the template, they should only be included if one has content for that section. Thus, if you do not have any roles in theater to speak of do not include this section. While it may be tempting to include that play you acted in several years ago as a child, this is considered irrelevant and a distracting waste of space by nearly all directors. Thus when choosing sections for a beginner Actor Resume, it is a good idea to focus on skills and training, if one lack recent work. 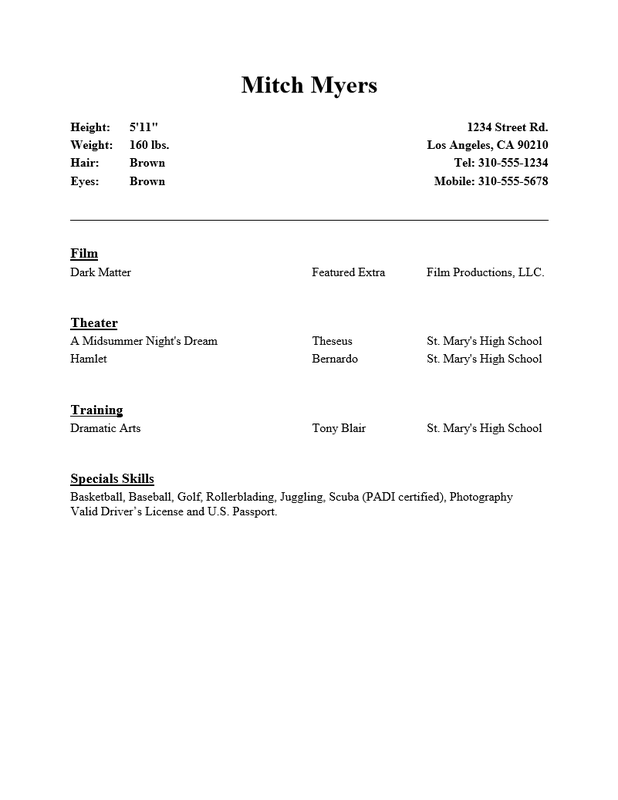 Once a Beginner Actor Resume Template is filled out it remains useful as one gains experience. One only needs to add sections for content as they gain experience. Step 1. The most noticeable section on your resume on first glance should be your name. Place this in the center in a large font. Your contact information (or your agent’s) should go below this in a smaller font. It is highly recommended to use a standard font for the whole resume (i.e. Times Roman Numeral, Arial). The alignment of the contact information is flexible but it must go below the name. Step 2. Your statistics are very important and should be accurate. This will give the casting director a better idea of what the person in the headshot looks like. Give your height, weight, eye color, and hair color. Eye Color and Hair Color may be optional if sending a very clear color headshot (which is standard now). If sending a black and white head shot these two descriptions absolutely must be present. This section may go below or next to the contact information. Step 4. The next section is typically the Experience section. This section is subdivided by media and each subsection will contain three columns (name of production, role or role type, and director/production company). The sections should follow a certain order: Theatre, Film, Television, Web Series, and Commercials. If you are in Los Angeles, place the Theatre section after Television but before Web Series. On either coast, unless specifically going for a commercial try to leave out the Commercial section if going for an old style production company. If you do not have experience in one of these sub-headings do not include it. Step 5. The Training section is the next section. Here you should list where you received training or any workshops you participated in. This information must be displayed in three columns: Name of Class/Certificate/Degree, Teacher, and School/Workshop. Step 6. For a Beginner Acting Resume, the Skills section will look a bit large. This is to be expected. List any skills you may have. These must be abilities you have that you can do reasonably well (i.e. basketball, harmonica playing, cooking a fantastic turkey). If you are an amateur or advanced place this status in parenthesis after the skill. The Skills section does not need to be in columns. Each skill may simply be listed and separated with commas. If it looks good in bullet columns you may do this. The key factor with any Beginner Actor Resume is that it is very easy to read and accurate.